We at Benincasa Community have experienced a few "finally!" moments as of late. Liturgically, Lent is finally over ... and we are back into our vices (hopefully, with a renewed sense of restraint). Seasonally, the rise in temperature has finally called forth all sorts of buds and birds. 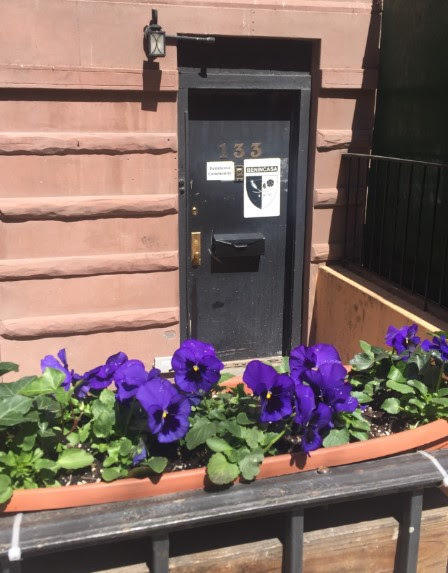 Our neighbor, Karen Lieberman, planted the most luxurious purple pansies in our flower boxes last week and Sean readied pots for our 3rd floor patio for tomatoes, basil and peppers. Much is blossoming here at Benincasa this spring! Finally we are ready to speak about Benincasa Community's learnings after nearly 3 years in operation. The wonderful organization Future Church has invited us to share about our model, our mission, and our insights into the future of religious life. It's a teleconference, so please call in and listen on May 16th @ 8pm You must sign up a few days ahead of the call to receive the phone number and passcode. After more than a year of planning and meeting, we are finally ready to launch Through Every Age (or the TEA Program) for friends of Benincasa Community seeking to deepen, mature and expand their faith. For too many of us, faith formation ends with Confirmation, or College, or a Volunteer Program. How do we continue to study and develop as busy adults? How do we create community among those seeking, questioning and challenging themselves and our Church? The program runs from September 2018 - June 2019. We will hold three information sessions in June. Think about joining us! Programmatically, we have finally begun a new Farm-Earth-Cosmology study at Genesis Farm with Dominican Sister Miriam MacGillis. Miriam is generous with her time, connections, and resources. Sean works at Genesis Farm four days a week; Jimmy drives Sean and Dominic out to the Farm on Sunday evening and Karen picks them up Thursday (each working one day at the farm)! Above left: Forsythia in bloom, and a magnolia tree on it's way! ; Above right: Our residence at Genesis Farm, aptly named "Bread and Roses": Yes, it is bread we fight for, But we fight for roses, too. And, finally, we share the news of the Kings Bay Plowshares! Seven Catholic Peace Activists, among them our mentor and friend Liz McAlister along with Carmen and Martha from the NYC Catholic Worker, show us that the work of peace making is never final, never quite finished.